In a bid to crack down on drunken airport accidents, airport bars are considering limiting drinking hours. Airport bars currently serve alcohol throughout the day, allowing passengers flying at any time to enjoy a pre-flight drink. This may not be the case for much longer, with new legislation looking to prevent the legal loophole that allows them to stay open past drinking hours. 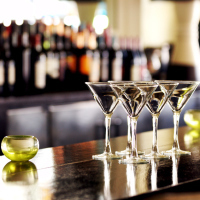 This may mean the extension of the Licensing Act 2003 by the Home Office to include airport bars and pubs. The change in regulations will be in a bid to prevent flight delays and other dangerous incidents as a result of drunken passengers, who risk facing fines or prison sentences for drunken behaviour. A spokesman from Airlines UK said: "Airlines believes that the exemption for airports from the Licensing Act should be removed so while passengers can still enjoy a drink to start their holiday, airport outlets would be subject to the same licensing requirements as bars, pubs and other outlets selling alcohol in towns and cities, as well as landslide at airports." Intoxicated passengers being arrested in airports have increased by 50%, according to a BBC investigation. Videos from recent years have seen passengers removed from flights, after they prevented the plane from taking off or threatening other passengers. In one video, a Ryanair passenger is seen restrained in a chokehold. Ryanair has spoken out in support of restricting alcohol at airports, suggesting a two-drink limit. Alcohol is not currently sold on Ryanair flights due to the fact they are often short-haul. Passengers are now banned from drinking their own alcohol, bought in duty-free, on Ryanair flights. Ryanair's Kenny Jacobs said: "This is an issue which the airports must now address. "We are calling for significant changes to prohibit the sale of alcohol at airports, particularly with early morning flights and when flights are delayed." It is expected that imposing this ban will prevent the abuse suffered by one in five cabin crew members from drunken passengers. Passengers who are arrested for drunken disorderly behaviour face fines or a two-year prison sentence, according to the Home Office. Booking a holiday soon? Get your personal insurance plan before you go.